Mark Moore Gallery proudly presents "Elsewhere" in the Project Room, an exhibition of new work by San Francisco-based painter, Patti Oleon. Predominantly intrigued by light and the tenuous nature of appearances, Oleon begins by taking photographs of public interior spaces devoid of human presence. These often include hotel and apartment lobbies, TV and movie set locations, and museum period rooms - all of which appear disassociated from contemporaneous place and time. 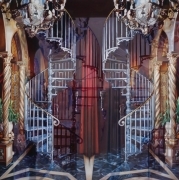 Once translated into her illusory oil paintings, these spaces represent an ambiguous reality that delves into viewer's unique psyche and memory. In this exhibition, Oleon debuts a newfound interest in dramatic manipulation and enhancement of objects and settings. Perhaps inspired by the ubiquitous nature of digital augmentation in commonplace imagery, Oleon emphasizes the affecting qualities of atmosphere and illumination rather than a loyalty to pure reality – as if ruminating on the emotional projections we apply to our recollections. Like ornate Rorschach patterns, Oleon's compositions suggest a disjointed narrative familiar to all, but specific to none; mirrored staircases, reversed corridors, and inverted shadows coalesce into kaleidoscopic dwellings rife with evocative allusion. Through their enigmatic allure, Oleon's paintings bridge reality with the surreal, simultaneously discrediting and embracing the idiosyncrasies of the physical world.